On Sunday afternoon, August 12, the Minnesota Orchestra headed to Durban City Hall for a quick touch-up rehearsal and early evening concert, its second on its South African tour. Here are photographs of the Orchestra in the auditorium and of the exterior of the City Hall. The following discusses that concert, the Orchestra’s interactions with local music students and a 1999 speech in Durban by Nelson Mandela. The announced program for the concert was the same as in Cape Town two days before as covered in a prior post. 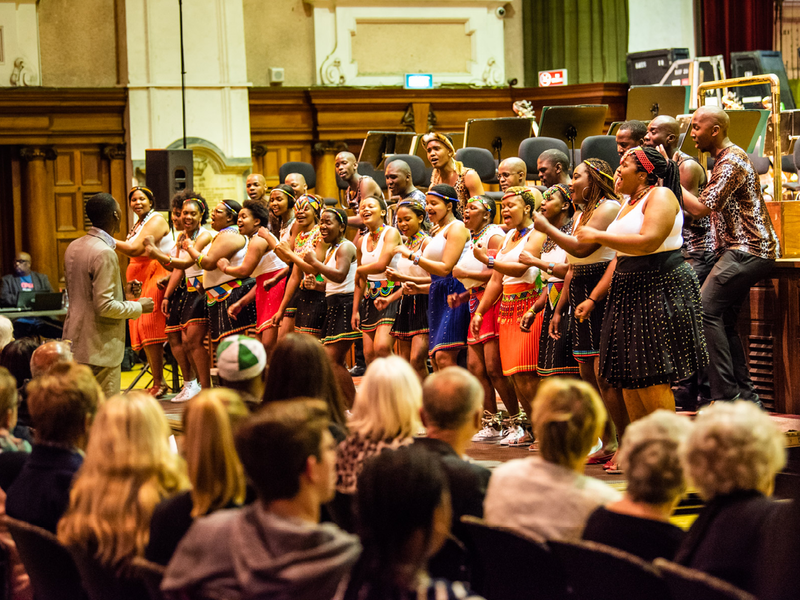 The concert, however, began with a three-song set from the Clermont Choir, which was founded in 1992 and specializes in many different genres of music with a focus on choral, classical and African indigenous music and which was conducted by Brian Msizi Mnyandu. Based in Durban, the group has 60 members, most of whom reside in the metropolitan area. The choir had the audience clapping and cheering while Orchestra members looked on, standing at the back and sides of the house. Below is a photograph of the Choir. For the encore, the Orchestra once again performed “Shosholoza,” a South African miners’ song that has become the unofficial national anthem. As was the case in Cape Town, the crowd didn’t recognize it at first. But once the Minnesota musicians started singing, the crowd, including the students from Inanda Seminary, went crazy, singing along and dancing in the aisles. After the concert as the Orchestra members were getting ready to leave, the Inanda girls sang their own version of “Shosholoza” at the front of the stage. While in Durban, some of the Orchestra’s wind players attended a rehearsal of the provincial KwaZulu-Natal Youth Wind Band. Its Conductor Russell Scott led the band in the “Jupiter” movement from Holst’s The Planets, as well as an African piece called Patta, Patta (“Touch, Touch”) that he arranged for wind ensemble. Following a performance by a Minnesota wind ensemble, the Minnesotans and students broke into small sections to get to the nitty-gritty of their instruments and parts. Durban is a city in a metropolitan area of 3.4 million (approximately the same population of the Twin Cities Metropolitan Area). Durban sits on the country’s southeast coast on the Indian Ocean with the country’s busiest port. Because of its beaches and warm, subtropical climate it is a major tourist site. Its City Hall, the site of the concert, is a quintessential example of Edwardian Neo-baroque architecture that was completed in 1910 and was considered very bold in its design at the time. On April 16, 1999, the City of Durban gave Mandela its “Freedom “award. Here are excerpts from his acceptance speech. “As we rebuild our country, we should remain vigilant against the enemies of development and democracy, even if they come from within our own ranks. Violence will not bring us closer to our objectives”. 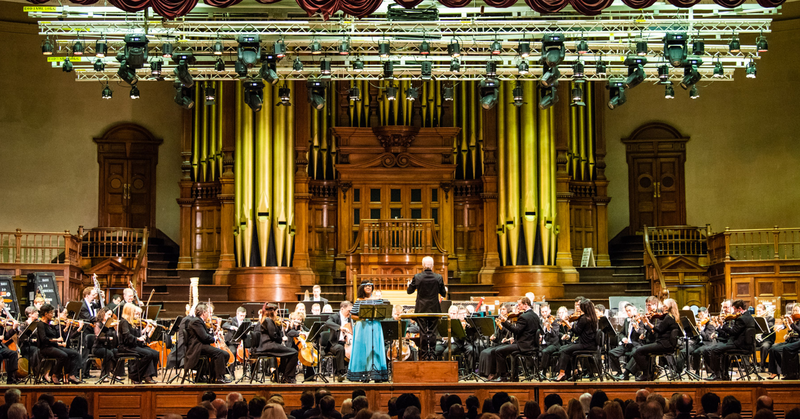 Minn. Orchestra, Concert in Durban South Africa (Aug.12, 2018); Minn. Orchestra, Durban/Aug 12. See generally MPRnews, Minnesota Orchestra; Startribune.com/orchestra. Nelson Mandela Foundation, Speech by President Mandela on receiving the Freedom of Durban (April 16, 1999).